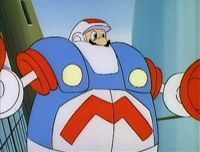 The Plumbinator is a Robo Suit which resembled a plumber that is built out of spare parts by Dr. Nerdnick and Bunsen for Mario and Luigi so that they can fight Robo Koopa. The Plumbinator requires both Mario and Luigi to operate it, with Mario controlling the suit's upper half, while Luigi manning the lower half. Not too much is revealed about the Plumbinator, but it appears to have been less dangerous and powerful than Robo Koopa's suit. Unable to fight off Robo Koopa, Mario, Luigi, Dr. Nerdnick and Bunsen retreat to a junkyard in Robo Land, where Dr. Nerdnick concludes that the only way Mario and Luigi can face Robo Koopa is with a robo suit of their own. Having limited access to parts and tools, Dr. Nerdnick improvises and constructs a robo suit from whatever he and Bunsen can find around the junkyard. Although Mario and Luigi have trouble keeping the Plumbinator's under control at first, they go off to face Robo Koopa. As Robo Koopa fights the Plumbinator, Mario and Luigi do what they can to fend off against his powerful attacks. They deflect his Bomb Plants with their fly swatter, and dodge whatever he can hit them with. Mario tries to blast Robo Koopa with several eggs, but they prove to be useless. Robo Koopa manages to wrangle the Plumbinator with a lasso, but Luigi cuts it with a pair of scissors. The Plumbinator tries to escape Robo Koopa by leaping on top of a rooftop, but Robo Koopa follows. Robo Koopa soon catches up with the Plumbinator and kicks it off of a building, causing it to fall onto a walkway and break into several pieces, ultimately destroying it. The Plumbinator only has four known abilities. It can extend a telescope from within its buckle, giving Mario enhanced vision capabilities. It can also extend a fly swatter from its buckle, which is intended for deflecting attacks. Lastly, it is capable of launching eggs from a tube that is built into the helmet, although what purpose this function is intended for is unclear, as the eggs do little to stop Robo Koopa. Also, it can jump very high. The Plumbinator was named for the film and titular character The Terminator. This page was last edited on September 12, 2018, at 20:11.